Facsimile: A reproduction of a book which attempts to capture the appearance of the printing in the original in all respects. Facsimiles are often marked as such and, unlike attempts to create a fraudulent copy of a book, make no attempt to deceptively emulate all the signs of an old book such as using old paper replete with the expected defects from use. The term also refers to any photo illustration included in a book which has been taken from the original document, letter, etc. ; or to any part of an original book which has been replaced with a reproduction. Fading: Applied to a book's covers or dustjacket, fading indicates a loss of brightness and intensity of color (a graying-out). Caused by a book's exposure to ultraviolet light (sunlight or fluorescent light), it usually differs from a stain (which it can mimic) by having gradual demarcations rather than a fairly well-defined border. See also Darkening. First and Second Printing Prior To Publication: When a publisher has had more orders for a book prior to the book's release date than were made in the first printing, a second printing is ordered. If both printings were made from the first setting of type or plates, both would be part of the first edition. The first printing would, however, have Priority. First Edition: Often misused and abused, the strict meaning of the term is all of the copies printed from the first plates or typesetting, including any subsequent Press Runs using the same plates or typesetting. Many books do not have subsequent editions, but may have many printings by the same publisher. As generally used by book dealers and collectors, however, the term implies more than the strict definition when all first editions of a book lack the same Priority: it means a copy of the book in it earliest appearance. Thus, the first printing of two or more printings of a book's first editions would have priority; and if there are different states or issues among that first printing, the earliest of those. How can there be differences among the books in a first run printing? There are two types. Separate States are created when the presses are stopped during a printing to correct one or more problems such as typesetting errors, battered or broken type, or other accidental matters which the publisher or printer considers too minor to justify abandoning the partial run and starting over. Separate Issues are created when a publisher intentionally decides to create differences (other than those requiring changes in the plates or typesetting) among the books produced during the first printing. Perhaps the publisher wishes to give customers a choice of bindings, type of paper, or even format. Whatever the case, if the first printing is without states, then issues become the focus for determining priority. Sometimes one issue can be determined to have priority over another (e.g. if the printer kept a record indicating the printing order) in which case one can identify a book as a first issue. More often, no priority can be established and the various issues are simply called Variants. It is important to note that the question of priority turns on when the sheets for the text of a particular book were printed, not when the sheets were folded into Gatherings, or the gatherings were bound. A different State of a first printing can be created even by the insertion of a cancel leaf after the book is bound provided that a portion of the first printing retained the original leaf. If the entire first printing has a cancel leaf, or all the books retaining the the first leaf were destroyed, then no States were created during the first printing. The signs which enable states or issues to be distinguished are called Points. First Edition Thus: An expression signaling a book is not a first edition by the original publisher, but a first edition of a later edition by another publisher. This usage gained currency due to the need to correctly described a book which was a first edition in a new appearance, particularly if there were additional editions or printings of the book by this publisher which need to be distinguished from one another. It is also used in the form of "First Thus" to indicate the presence of important revisions made by the original publisher to a later edition such as the addition or replacement of illustrations or an introduction, its first appearance under a new title, or a special commemorative edition. First Trade Edition: When a publisher has issued a Limited Edition of a book prior to release of the less artful edition intended for the general retail market, the former is the true first edition (or printing, if the same typesetting is used for both) while is the latter is distinguished as the Trade Edition. Flatsigned: A book signed by the author directly on a page of the book. Author's signature is not on a bookplate and stuck onto the book, and the book is not Inscribed. The term 'flatsigned' is not generally accepted within the book-dealer/collector world - it is an invented misnomer - the accepted term, by book dealers and collectors is Signed. Flyleaf: The blank leaf or leaves following the front free endpaper, and those (if any) preceding the back free endpaper. See Figure 5. Font: A full set of printing type of the same design and size. Foot: Bottom of the book's spine. Fore Edge/Foreedge: The collective edges of all the leaves opposite the spine or bound edge of a book. See Figure 5. 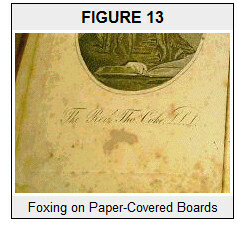 Foxing: Distinctive brownish stains, which can be specks, spots or larger blotches, appearing on the pages of a book. The cause or causes of foxing are not completely understood, but are fungoid or chemical in nature. Most commonly found in machine-made paper of the 19th century thru the 1950s which had a high acidic content. See Figure 13. Frontispiece: An illustrative Plate among the preliminary pages, usually facing the title page. Full Leather: A book whose boards and spine are bound uniformly in leather.